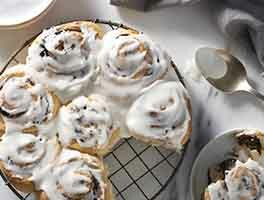 Love those ooey-gooey cinnamon buns you find at the shopping mall? 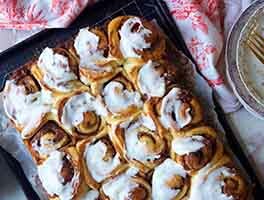 These sweet, tender (some would say squishy) cinnamon buns, crowned with a thick dollop of rich cream cheese icing, make a trip to the mall (or airport) unnecessary. Place the dough in a lightly oiled bowl, turn to grease all sides, cover the bowl, and let the dough rise until it's nearly doubled in bulk, 1 to 2 hours depending on the warmth of your kitchen. Counting calories? Feel free to make 2 dozen smaller buns. Roll the dough the long way instead of the short way, and cut it into 24 slices. 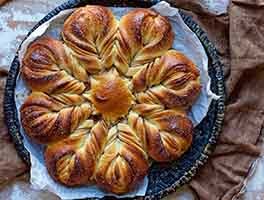 Place them in the pan in six rows of four buns each; they may seem crowded, but that's OK. Bake as directed. 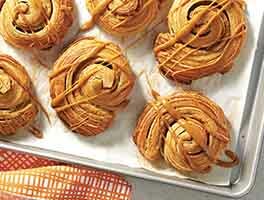 Want to make these rolls ahead of time, freeze or refrigerate, and bake in the morning? To freeze, see our blog posts, Freeze! Time-savers for the holidays. To prepare the night before, place the shaped buns in the pan, cover the pan, and refrigerate overnight. Next morning, let the buns warm at room temperature for about an hour, covered. Uncover, and bake as directed. Note to self: Always read the comments, and ALWAYS weigh the ingredients. I was in a hurry so measured the flour and used too much. The dough was really dense and didn't rise in time to have them for brunch, sadly. But, came back after brunch and they had risen, so I made them. SO delicious! Even though my dough was dense the flavor was sweet, with tang from the frosting, and the cinnamon was perfect. I'll make these again--weigh out the ingredients, and make sure I have at least 2h to rise. I also let the dough rest for a few minutes after I rolled it out which softened it some. Next time, I will also roll the opposite way and make 24 smaller buns, because that size would be perfect! Just baked these today... hubby is on his second roll and Said they are great!My dough was very sticky, but I stuck with the amount of flour (weigh it out!) and I didn't rush the rising process...I made 18 rolls and they are delicious and so soft! These will be made again and again! I halved the sugar, after reading some of the reviews, and still found these far too sweet which is a shame because they are otherwise good. Dough was slow to rise and buns needed almost 30 minutes at 400, far longer than the recipe said. I've made these twice and both times I have had issues with the dough not rising. I don't usually have issues with dough not rising, but for whatever reason I've had trouble with this one. After an 1.5 hours, I finally put the dough in a warm oven and it did rise a little. It's been a cold winter so maybe my kitchen isn't as warm as it needed to be. I'll keep trying because even though they don't rise well, they still taste great. They are a little more dense in texture, but the flavor is still good. I am going to have to try this one again. It tastes great, but I am concerned with my dough this first time around. I measured my ingredients in grams as I do for my bread and mixed by hand. The "dough" did not rise even after 3 hours or more. (Fresh yeast and 100-degree water) The "dough" was very sticky. I could not roll it out. I had to mix in a bunch of flour to get this to not to stick to everything. I proceeded to make these and they turned out great but will try mixing a different way next time to see if it was just me. I baked this recipe all the time. My brother and his friends say they're the best cinnamon rolls they've ever had. They say just as good or better than Cinnabon. That in my opinion is saying something because Cinnabons are crazy good. I'm waiting on my dough to rise at the moment and sending a batch over to my brother's house for him and his friends. Definitely my go-to recipe as this is probably the 12th time I've made them LOL. Enjoy everyone! This recipe was so good! I felt like it was easy to follow, the dough was easy to make and everything rose well! The cinnamon buns were very delicious, soft on the inside and less soft on the outside, and they really tasted like Cinnabons. They also lasted a long time- I had the last one over a week after I made it (and it was sitting on the counter the whole time) and after warming it up, it was delicious! Perfect cinnamon roll ! That being said- directions could be more specific for non expert dough makers. Such as, order to put ingredients in mixer, when to add yeast, lukewarm means ? On a thermometer , what to do if they don't raise . I read the specifics to measuring flour which were helpful, I suggest adding specifics to working with dough. Mine did not raise much at all in either attempts , we ate them And found them to be tasty but of course, heavy and doughy due to the lack of proofing and raising(my error ) Great recipe that I appreciate - but please put some helpful suggestions in. Thanks!! !